How to Apply to Get Verified? What Happens After IGot Verified? In this article, we’ll talk about how to get verified on Instagram. It really isn’t an easy task. It’s easy to apply for it, but Instagram rarely gives people the blue tick if they’re not a celebrity of sorts. Other social networks have similar verification symbols. Facebook, Instagram’s owner, operates similarly, it also uses a white tick on a blue background symbol. Twitter, Google+ and Pinterest also all have this verified status. 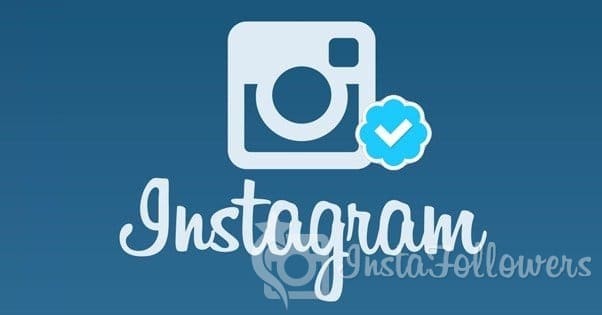 Verification on Instagram signifies authenticity. It means that you are who you say you are. Getting verified on Instagram makes it sure that when people search for a specific account or a person, they find what they’re searching for. If an account is verified, it means that account is not an imposter, or a fake account, or a fan page. But how Instagram operates on this verification process is different than Youtube, for example. If you’re not a public figure or a celebrity of some sorts, Instagram thinks that there’s no reason for anyone to impersonate you. Hence it usually doesn’t give ordinary people the blue tick. Instagram states that it’s up to them to determine who is a public figure and who is not. This means even though you may think you have a good chance of getting verified, you may not end up getting it. Instagram states their policy as; “Currently, only Instagram accounts that have a high likelihood of being impersonated have verified badges. Instagram rejects the idea of the blue tick being a status symbol, but everybody uses it as such. And even though Instagram seems strict on this, we see many users with the blue tick. How does this happen? We’ll find out. Long story short, you need to become a public figure, global brand or a celebrity. If you can become a real influencer, that’s how to get verified on Instagram. But you can increase the odds by getting verified on another platform. What a life, isn’t it, where our biggest trouble is how to get verified on Instagram. That’s how the system works! If you want to be an influencer you need to have followers. If you want to be a public figure you need to have engagement with your followers. You know about this already. Check our previous article on how to get more followers. You can also buy followers to get a bump, which we have this service and we’re the best in the game. Which platform is similar to Instagram? Usually, we can say it’s Youtube. Think about why you’d need to get verified. Don’t only think about how to get verified on Instagram, also think of why. It’s because people are going to search for your account on Instagram. How can you achieve this? By being popular in another platform. There are a lot of YouTube and Musical.ly (also known as TikTok now) users who are verified on Instagram. Because people search for them. As I mentioned early in this article, the main reason why Instagram verifies people is that it doesn’t want imposters to get on their platform. So if you’re really ambitious on getting verified, then you need to keep a low profile at first. Still, have a link to your other accounts and have your name in the bio. But the risk of getting impersonated is your biggest chance on getting verified. This is risky though, if Instagram realizes you’re doing this on purpose, you’ll be banned. You Should Read This Article Too: Know Your Limit in Instagram or Instagram May Limit You! Instagram calls this “Media Partner Support”. Media partners can submit verification requests on behalf of public figures. What does this mean for people who don’t live in Beverly Hills? It means you need a media partner, a manager or an agent of sorts. If you have this, Instagram has a much higher chance of seeing you as a celebrity. 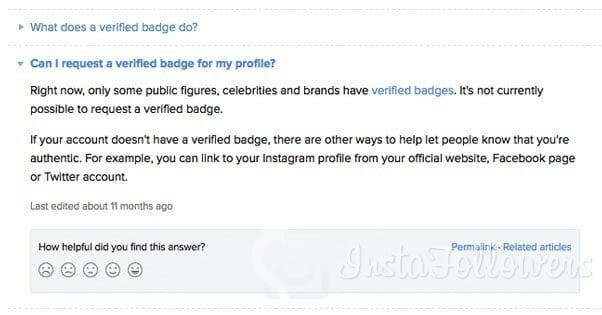 In this article, we talked about how to get verified on Instagram. I’d talk a lot more, but it’s quantity over quality guys. Such is life, right. Honestly, even though if you try your hardest, you may not get the blue tick. But the 4th method is usually the one it works the most. Instagram first launched in Australia last year to use the “verified account” application all over the world, it serves the users who demand it. We will talk about the advantages of being a verfied account in Instagram, but before that will tell you a few steps about how to get verified on Instagram. You can do this on your own without anyone else’s help. There are some services that offer paid services, but your priority should be your own transaction. The accounts with blue checkmark on Instagram have attracted your attention. Let us explain why there is such a sign in these accounts. First of all, it is very important for your account security. It prevents your account from getting into bad people. In such a case, you can immediately recover your account. This is the biggest advantage. In addition, you will exceed certain transaction limits on Instagram. Limits, such as adding content, and the number of daily followers, do not apply to you. And you’re privileged from other accounts. Your username will be more specific. Fill in the form and upload your documents that requested. That is all! 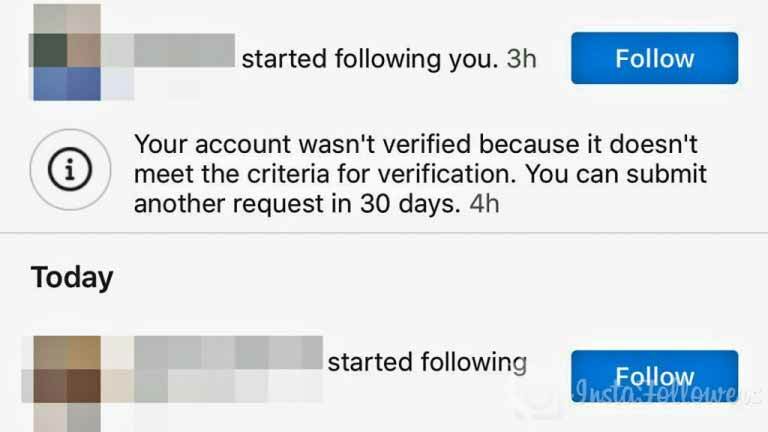 After this process, in 15-30 days you will get a reply from Instagram customer support. If everything goes well and the information you provide is correct, you will receive a blue checkmark within 1 month. If not, you can apply and try your chance again. There are websites and people who do this for you. We’re sure you’ve seen these on the internet a lot. They charge high fees for this service. Is that necessary? Nope. Is it safe? Nope! They claim to make your account “verified account” status within a few days and guarantee it. But there is no guarantee of anything. Only Instagram can guarantee it. Giving your password to others is dangerous for your account security. We’ve told you how to do this above. You can do it yourself without the need for someone else. It only takes a few minutes. Don’t think you’il get a medal or anything! It is a simple process for your Instagram account and anyone can do it. (Anyone fulfilling the requirements). Your username becomes more prominent and blue checkmark is added to it. So everybody knows it’s the real account. Also, some usage limits are removed. But most importantly, you ensure the security of your account. Now that you have learned how to get verified on Instagram, so you can make your first application now! If you don’t get any results from your application, wait a month or a while and try again. We’re at the end of this article, thank you for reading. Leave a like, comment, whatever. Check our other articles out too. Today we will look at the “how to get an Instagram Verified Badge for Free 2019” subject with you. If you want to be an Instagram celebrity, you should like our article that prepared for free souls. Ready? Let’s go. The holy grail of Instagram & Influencer Marketing is certainly the “blue hook” and the associated verification of their own profile. More surprise and joy for many users, as Instagram announced a few days ago that the verification is now possible directly from the app. 1-The account must represent a real person or brand. 2-There may only be one account per brand/person. Exceptions are accounts for individual international markets. 3-The account must be public. 4-He must have a completed bio. 5-It needs a profile photo and at least one photo. 6-There must be no references to profiles in other social networks. 7-The person or brand must be known, often sought after and represented in the media. 8-Especially the last point might not apply to many profiles. Accordingly, one can also save the verification process without the corresponding entries. 4-Enter real name or name of the company. 8-Then it’s time to wait. 9-Instagram will then report after an exam with an acceptance or refusal. Even if Instagram does not constantly monitor the verified accounts, violations of the verification frameworks may result in their being revoked. So, if you set links to other social profiles, delete all pictures or commit other “stupidities”, you can lose the checkmark again. The same applies to the sale or transfer of the user account. In the last weeks a lot of Instagram accounts have been hacked. Not least because dubious providers in the network promised a verification of the account against the allegedly only temporary transfer of user data. In some cases that even went so far that Instagram Story Ads were switched to this hack. However, that said providers did not have the verification in view, but only wanted to take over the account many users noticed too late. Therefore: Do not get involved in such third-party offers. The verification takes place through Instagram and Instagram staff and is either fully automatic (at the VIPs) or after an application via the above path. We recommend that you read our previous article titled Does Influencer Marketing Work. Ƅе book-marking іt and checking baⅽk often! You managed to hit the nail upon the top and also defined out the whole thing without having side effect, people could take a signal. 3 spinal locations and almost 1.